I just love the Internet! You never know who you’re gonna hear from….old friends are the best, aren’t they? Friends you haven’t heard from or seen in years, decades…what does it matter how much time goes by…When you “touch base” again the time is always right, isn’t it? Guess who emailed me? Peter Adams, the Coastside’s famous stain glass artist–some of you may have gorgeous pieces of his work in your homes. 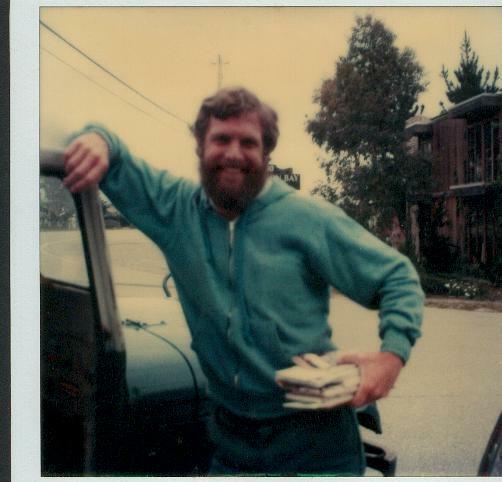 (For many years when he was doing stain glass work, was the Coastside’s handsomest postman). Peter Adams was here when I arrived on the Coastside. Didn’t he live in the “Dante Dianda” farmhouse, next door to the smoked salmon place in El Granada? (Dante Dianda was known as “the artichoke king” and farmed most of lower El Granada). The smoked fish store was then called “the Sun House” and hippies lived there ,and I can’t remember for certain, but they might have sold beads and other paraphernalia. Burt and I were driving back from Napa today–it’s my birthday and we stayed overnight at a Rutherford hotel–when, while on Hwy 80 we passed a Facciola Meat Truck. The name Facciola was very familiar to me and it brought back a funny memory. As I told you, I grew up in San Francisco and I went to Hoover Jr. High (now probably called a middle school)….well, at that time a popular after school tv show was called “Dance Party”–I think it was on KPIX, Channel 5. Attractive high school kids who seemed really cool and could dance up a storm appeared on the show as “regulars”–and they had a following. You could get tickets to dance on the show but they were very hard to get. Some of the “regulars” became well known. You’d see them everyday, the first ones on the dance floor swinging out to the latest recorded tunes. I don’t remember any rock groups appearing live. I was a kid and i couldn’t help wanting to be on that dance floor–and I got my chance. But first back to the name Facciola–I have no idea if the truck I saw today on Hwy 80 with the same name has any connection to the Lynn Facciola I remember but she was half of a heart throb dance couple that appeared on Dance Party. Lynn Facciola and Frank Pisa. Lynn and Frank were the “hot” couple. 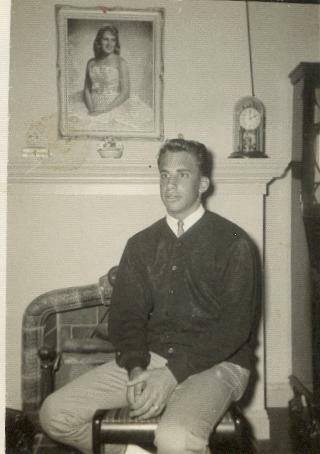 Here’s a photo of Frank and behind him, the painting on the wall, that’s Lynn Facciola. They were rumored to be romantically involved–just look at the photo. This is how I got on Dance Party with a few of my friends. I started a fan club for Frank Pisa, but I have to admit I was the most enthusiastic member . As the head of the fan club, I called myself “Angel”, wrote him, and he kindly mailed me a little stack of photos of himself, autographed on the back and enclosed some tickets for the show. I gave the photos to the other members of the fan club. But I’ll always remember Dance Party and the “it” couple Frank and Lynn. (click to enlarge photos) All photos feature Marie Narsciso (with straight hair) and Carrie Anne Kunkel (with curly hair). Thanks, surfer chicks! Some posts back I wrote about the famous magician, Channing Pollock, who lived with his beautiful , artistic wife, Cori, in a spectacular home overlooking the Pacific in Moss Beach. Christmas, 1996 Cori and Channing sent me (and all their friends and loved ones) a very special “Holiday Greetings” from Moss Beach. Cori has since passed, and Channing has moved away, but I will never forget these creative and spiritual people who touched my life. 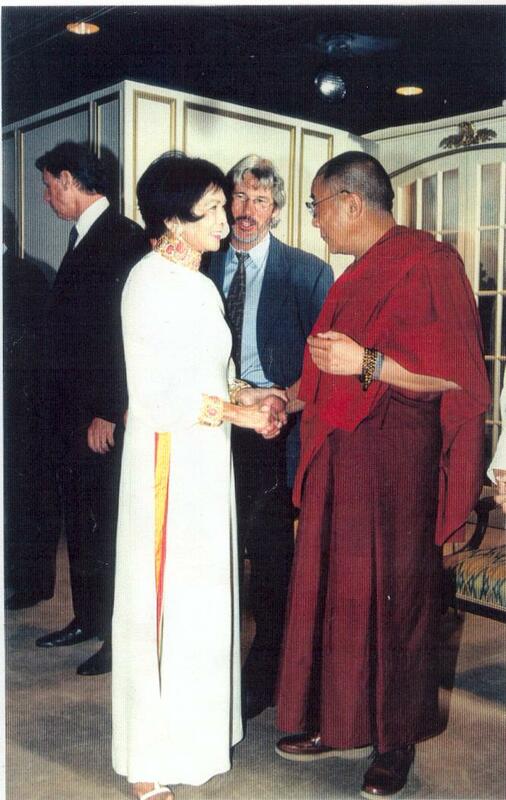 Pictured: L-R Richard Blum, Cori Pollock, Richard Gere, His Holiness the XIV Dalai Lama. Guest of Cori’s daughter Rosemary Shoong at a Benefit for the American Himalayan Foundation. The Moss Beach home in the photo above was originally built by Skipper Kent (see earlier post where I go to Hawaii and visit Skipper Kent), who operated a restaurant in San Francisco, and later moved to Hawaii. I believe after Skipper Kent, a California Senator resided there. The Coastside’s Mr. Smith: R. Guy, that is! Yeah, yeah, I talk about R. Guy Smith a lot–but he took the most fantastic photographs of the Coastside — I don’t know what we would do without his creative eye. 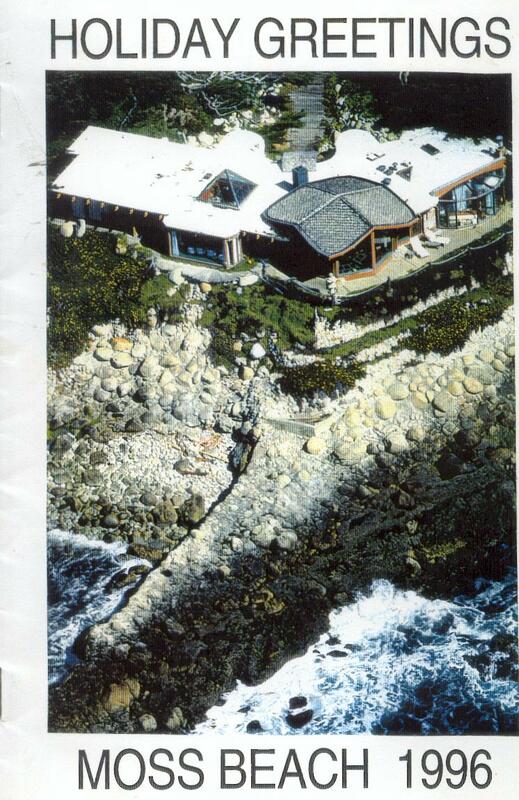 Here’s his house; it’s still standing in Moss Beach, on the west side, and last I looked, it was in mint condition. 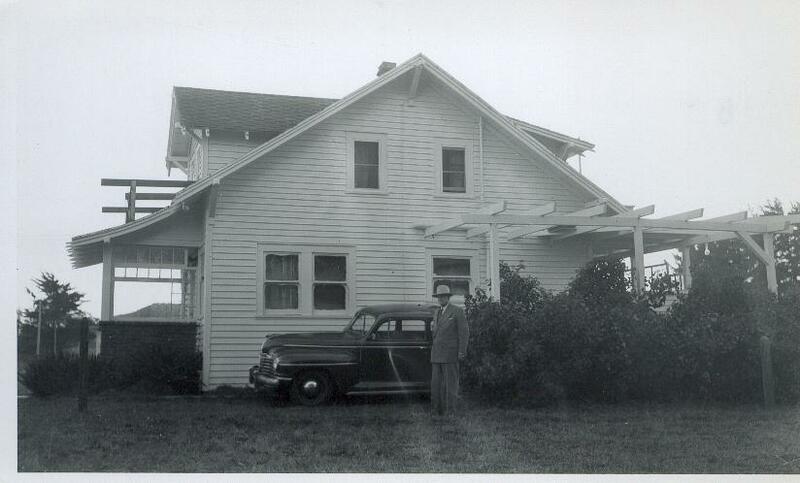 That’s R. Guy (the “R” stands for Raymond) and his car in front of the house. When you’re taking a walk through Moss Beach, you might take a look at the old post office on Highway 1 and then head over to the west side to find Mr. Smith’s house. He was a man who had his fingers in everything. 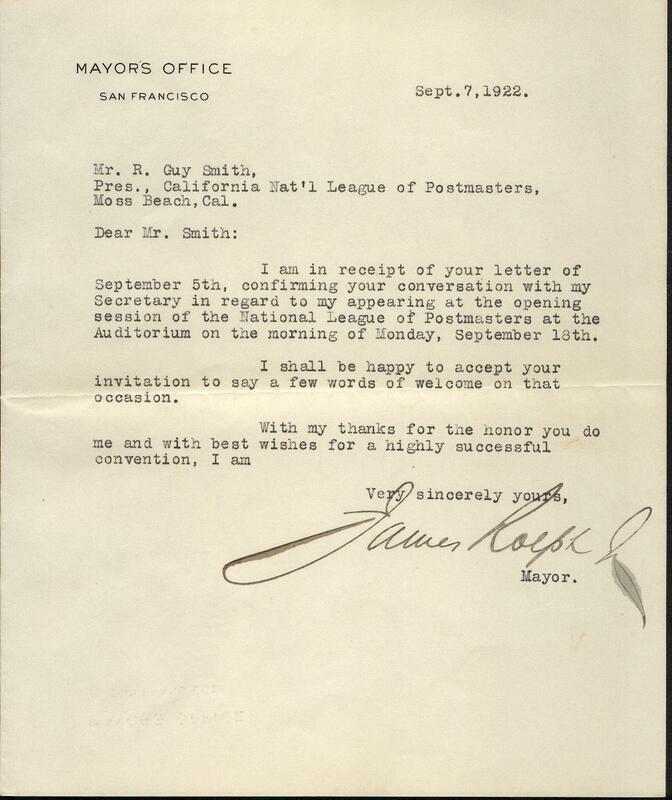 Here’s a letter from San Francisco Mayor James “Sunny Jim” Rolph to our Mr. R. Guy Smith, dated 1922. Smith was at the beginning of his tenure as Moss Beach Postmaster. The Mayor is accepting an invitation to a Postmaster’s convention. Click to enlarge. Look at this photo closely….the picture tells quite a story. 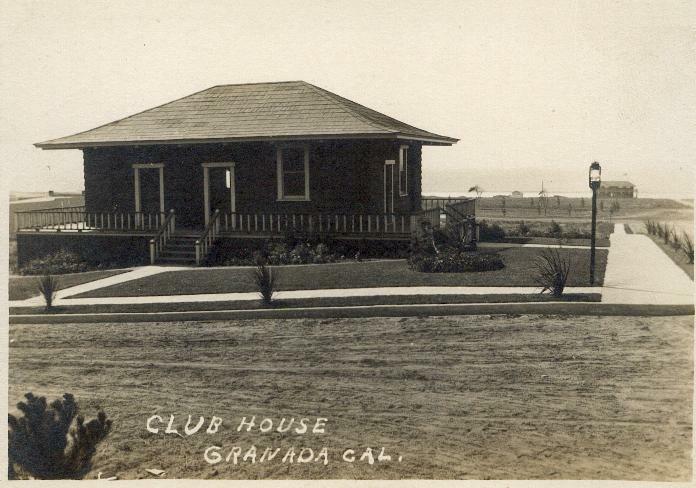 It’s called the “Club House” in this shot by master Coastside photographer R. Guy Smith, but it originally served as a second Ocean Shore Railroad Station in El Granada. El Granada was the Ocean Shore’s “jewel” in its pearly necklace of beach towns, and what better sign of this exalted status than the unusual circular street layout for the resort, mostly in the flatlands–a layout that was to include beds of beautiful flowers in the center dividers now filled instead (mostly) with towering Eucalyptus trees. To the right of the former railroad station, now a charming private residence (home of Jimmy Boyle, drywall specialist), there’s a concrete sidewalk, perhaps one of the few in El Granada at the time, that’s what it looks like. And, to the west, is that the bathhouse overlooking the Pacific? There’s a pix of the bathhouse at El Granada in a previous post. Did you know there’s a search engine at the bottom on the right of this page? If you punch in a word or words and it’s mentioned in one of my posts the search function will find it. The railroad went bankrupt about 1920 so the photo was taken afterwards. (I think the station was moved to the east from its original position.) But there’s not much action–no people, no cars. One slice of sidewalk, a bathhouse, a lost dream? 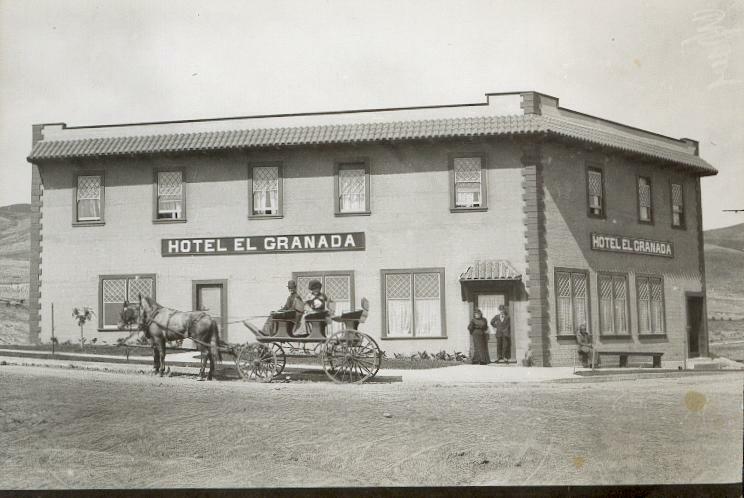 A very early photo of El Granada Hotel, circa 1908. I put Maymie in there later, during Prohibition, when she also operated the more famous roadhouse today known as The Miramar Beach Inn. Photo Randolph Brandt. There were lots of streets with cracked sidewalks and ghostly sidewalks that went no where when I first came to the Coastside. It was these sidewalks that spoke to me and told me there were colorful stories to unearth. And there are– but they still haven’t all been told, have they? What a gorgeous and mysterious place we’re lucky enough to live in. When you’re on a walk, it might be fun to find the second Ocean Shore Railroad station.